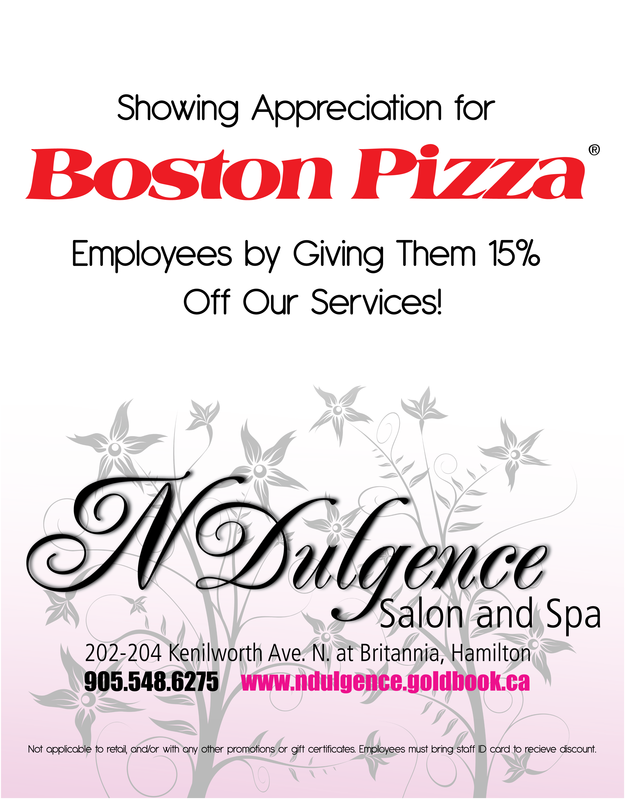 As one of Hamilton’s longest running award winning hair salons and mini spas, NDulgence Salon and Spa – located at 204 Kenilworth Avenue North – ran an advertisement in collaboration with the multi national restaurant chain Boston Pizza in order to advertise their upcoming employee appreciation day. Together, Dion Rodrigues Design and NDulgence Salon and Spa created a print ready flyer that elegantly got the message across to Boston Pizza employees prior to the event. The finished copy of this flyer design was printed and displayed across all of the Boston Pizza restaurant locations in the Greater Toronto and Hamilton Areas.